8. Does Dreaming Have Any Adaptive Function(s)? On YouTube: "Seven Surprising Discoveries That Changed My Thinking About Dreams" — A one-hour lecture by Bill Domhoff that discusses many of the topics in The Emergence of Dreaming. On UCSC.edu: An interview with Bill about the new book. This book presents a new neurocognitive theory of dreams. It is distinctive in that it emphasizes the similarities between dreaming and waking thought, demonstrates that personal psychological meaning can be found in a majority of dream reports, has a strong developmental dimension based on excellent longitudinal and cross-sectional studies carried out in sleep labs with children ages 3-15, and locates the neural substrate for dreaming in the same brain network active during mind-wandering and daydreaming. In addition, it marshals the evidence that shows it is very unlikely that dreaming has any adaptive function. These claims are based on five different sets of descriptive empirical findings that were developed between the late 1950s and the first 17 years of the twenty-first century. All of these findings were unanticipated by scientific dream researchers and then resisted to varying degrees by dream theorists for a variety of reasons. The first five chapters spell out the theory and the evidence for it without any discussion or criticism of past theories. However, the next two chapters present detailed criticisms of the shortcomings of two major alternative theories, activation-synthesis theory and Freudian theory. The penultimate chapter presents evidence that it is very unlikely that dreaming has any adaptive function in the evolutionary sense of the term, although it stresses that humans have invented uses for dreams in religious and healing rituals. In that regard, dreaming has an emergent function in culture that develpped in the course of history due to human cognitive capacities. The final chapter presents a general agenda for future research using new methodologies and technologies to test all of the hypotheses. 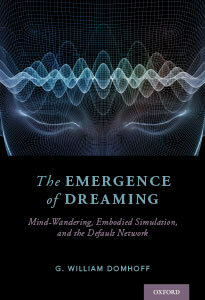 The Emergence of Dreaming is available for purchase on Amazon.com. "Domhoff reviews in wonderful detail the history of scientific research into dreams over the last 65 years, showing the rigour of lab and non-lab studies.... [He] provides a comprehensive and captivating account of experiments and theories in the field, including his own content analysis work and neurocognitive account of dreaming." "At a time when numerous disciplines are witnessing a renewed and burgeoning interest in dreams, Domhoff offers the reader a lucid and eye-opening analysis of the literature, from foundational studies of dreaming and dream content to recent discoveries in the neurosciences. Domhoff has produced an exciting, insightful book that brilliantly pulls decades of accumulated findings and ideas together into a compelling and state-of-the-art neurocognitive theory of dreams. Erudite, groundbreaking, and utterly fascinating, Domhoff's The Emergence of Dreaming is a 'tour de force' of original thinking and sets a new standard in the field. A must-read for anyone interested in dreams." "Domhoff treats us to a fascinating book about a fascinating topic. A tour by a master through the science of dreams, from the discovery of Rapid Eye Movement Sleep to the latest research. An easy to read introduction for anyone, yet so comprehensive and detailed that every researcher will learn something." The introduction presents a brief overview of the main new points in the ensuing chapters. It then discusses the impediments to dream research, the different meanings of the word "dream," the limitations of many past studies, the statistical methods that are employed, and the rationale for the order in which the argument and evidence are presented. Chapter 1 highlights the most important and enduring findings from systematic studies of dreaming in sleep laboratories, then discusses their implications. Most importantly, these frequently replicated studies show that dreams are a reasonable simulation of waking life, which are only rarely highly unusual or "bizarre" in their structure or content. These studies also show that dreaming happens in NREM Stage 2, during the sleep-onset process, and even in brief episodes during drifting waking thought, as well as during REM sleep, which shows that dreaming is not tied to one stage of sleep, or even to sleep. The chapter explains how dreams collected in the sleep lab can provide a bridge to high-quality studies of dream reports collected in non-lab settings. Chapter 3 presents findings from the study of individual dream journals kept by different individuals for their own diverse purposes, and not as part of psychotherapy. It first presents the methodological and statistical case for using such journals. These nonreactive, unobtrusive measures (which are called "dream series" in the literature) lend themselves to a variety of quantitative studies. The systematic and replicated findings from such studies reveal that dream content is far more consistent over months, years, and decades than could be realized from lab and non-lab group samples. They also demonstrate that there is continuity between the personal concerns enacted in dream scenarios, whether positive or negative, and the waking personal concerns of the dreamer. This is especially the case in terms of characters, social interactions, and activities (such as a passion for music or sports). However, the chapter also stresses that there is much dream content that is not understood. The fourth chapter provides the most complete and detailed account of the development of dreaming between ages 3 and 16 that has ever been assembled. It also includes new findings with teenagers that have not been published before. It concludes by drawing on the developmental psychology literature on conceptual abilities, mental imagery, narrative skills, imagination, and an autobiographical self to explain why dreaming is a gradual cognitive achievement that is not fully adultlike in frequency and complexity until ages 9-11 and in content until ages 11-13. The fifth chapter presents the evidence for the idea that the neural substrate that enables dreaming is based in subsystems within the waking default network. The evidence for this hypothesis includes neuroimaging studies of representative samples of children and adults as well as studies of neurological patients who report they have experienced alterations in their dreaming, or even lost the ability to dream, due to their injury or illness. Based on these relatively new findings from many research settings, some as recent as 2016 and 2017, both the developmental trajectory of dreaming and the nature of dream content can be explained by the neurocognitive theory of dreams. This chapter provides the most detailed critical analysis yet developed of the neurophysiological theory of dreaming called activation-synthesis theory, a bottom-up theory that rejects a top-down neurocognitive approach because rigorous studies of dream content allegedly cannot be carried out, especially on the basis of dream reports collected in the sleep lab. This theory suggests that dreams may be "cognitive trash." The chapter draws on detailed neurophysiological evidence little known outside of neurophysiology, and hardly at all among dream researchers, to show that all of the empirical claims put forth by activation-synthesis theorists in 1977 had been shown to be wrong by the mid-1980s, with further evidence for this refutation appearing in the 2000s due to methodological and technical advances. Similarly, the studies of dream content by activation-synthesis theorists have major flaws and are contradicted by most of the findings presented in earlier chapters. Chapter 7 presents a detailed, empirically based refutation of both the classical Freudian theory and the attempt to recast it as neuropsychoanalysis based on neurological case studies. It presents the evidence that dreams do not have the adaptive function of preserving sleep, as Freudians claim. It further shows that no systematic psychological studies of Freudian claims about the cognitive mechanism that create dreams or about the nature of dream content have been supported. Nor is there any evidence that the Freudian method of free association has any value in understanding the meaning of dreams. Chapter 8: Does Dreaming Have Any Adaptive Function(s)? Chapter 8 critiques three separate theories that claim that dreaming has a forward-looking adaptive function, such as problem-solving, threat simulation (said to prepare people to deal with waking threats), or memory consolidation. It shows that all three theories rest on questionable assumptions and are contradicted by a wide range of systematic empirical studies. The chapter concludes with the hypothesis that dreaming, like music, is a non-adaptation, a by-product of cognitive skills that were selected for other reasons. The chapter further suggests that dreaming is in some ways a useful non-adaptation because in the course of human history virtually all cultures have invented uses for dreams, such as in healing and religious ceremonies. The final section of the chapter reminds readers that there is psychological meaning in dreams, and claims that both cultural uses and psychological meaning have to be considered separately from the issue of evolutionary adaptations to develop a viable theory of dreams. The ninth and final chapter returns to the forward-looking orientation of the first five chapters by presenting an agenda for future dream research, which makes use of recent developments in both communications (such as smartphones) and neuroimaging. It suggests how new and better studies can be done of dream recall, dream content, and the development of dreaming in children. It suggests a counterintuitive way in which the neural substrate that very likely supports dreaming could be studied in greater detail by detecting the brief episodes of dreaming that are now known to occur during extended periods of drifting waking thought (e.g., during mind-wandering and daydreaming). This attempt to capture the neural network for dreaming during a brief waking dream perhaps would be best carried out using the more recent, mobile technology called Near Infrared Spectroscopy (NIRS), which also tolerates head movements well. If NIRS were combined with the EEG, the result might be even more valuable. An online-only measurement and statistical appendix provides a detailed explanation of the measurement and statistical issues involved in the study of dream content. This document gathers together past explanations and analyses that appeared in several different places, and at the same time provides updates and more recent statistical additions, such as discussions of the issues of multiple testing and autocorrelation. It also presents a critique of alternative coding systems and of some of the statistical procedures that are sometimes used in conjunction with content analysis. Click here to access the appendix.